Opening protection with impact-resistant glass. They should be structurally attached to the building in order to prevent the entire window from popping out of its frame. Sliding glass doors are especially vulnerable to flying debris due to their large expanse. 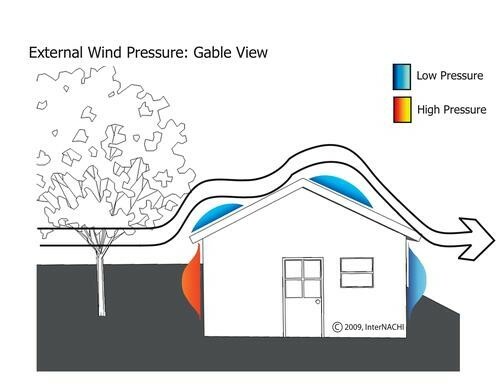 Once an opening is created during a windstorm, the pressure within the house can rise high enough to cause the roof to fail in areas of low pressure. The picture to the right demonstrates how these areas of low pressure can form. Contact The Village Home Inspector, LLC for Residential Home Inspections in The Villages, Florida and surrounding areas. 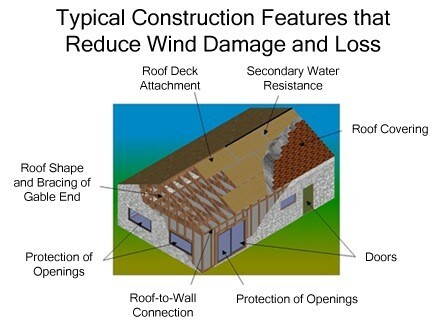 Call us (352) 299-3127 for more information on our home inspection services.